The Illinois 2nd District Appellate Court recently answered an important question for the victims of dog bites and the owners of those dogs. When is a dog owner no longer strictly liable for a dog’s aggressive behavior? Illinois courts now say that a dog owner not responsible for animal at the veterinarian, under the Illinois Animal Control Act. As always with common law, the answer came in the form of an opinion from a real situation. 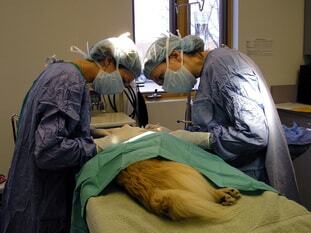 Tina Adams took her Lhasa Apso dog (Gucci) to the veterinary clinic for a surgical procedure and then went to work. Prior to the dog’s surgery, a vet clinic technician took the dog for a walk. Unfortunately, the dog got loose and escaped the vet clinic facility, running down the street. With the technician in pursuit, the dog ran toward Kristin Hayes (9 years old), who was waiting for the school bus. When Kristen tried to stop the dog, Gucci bite her on the hand. The bite required several surgeries to correct, forcing Kristen to endure significant pain and suffering, incur substantial medical bills, and miss out on a variety of activities that she enjoyed. Notably, Tina Adams was at work when the bite occurred and knew nothing about Gucci’s escape or his bite on Kristen until sometime later that day. In her lawsuit, Kristen claimed that under the Illinois Animal Contract Act, Tina is strictly liable for her injuries. Kristen also filed a claim against the veterinary clinic, as they harbored and controlled the dog at the time of the attack. In response, Tina filed a Motion for Summary Judgment, alleging that since Tina was not caring for the dog at the time and had no dominion over the dog, then she cannot be held liable. The trial court agreed, granting Tina’s motion and letting her out of the case. On appeal, we get some answers. The Illinois Animal Contract Act states: “If a dog or other animal, without provocation, attacks or injures any person who is peaceably conducting himself in anyplace where he may lawfully be, the owner of such dog or other animal is liable in damages to such person for the full amount of the injury sustained.” Read More about the Illinois Animal Control Act. The statute does not leave a lot of room for debate, especially since an “owner” is “any person having a right of property in a dog or other animal, or who keeps or harbors a dog or other animal, or who has it in his care, or acts as its custodian, or who knowingly permits a dog or other domestic animal to remain on or about any premise occupied by him.” In fact, most Illinois dog bite attorneys look at these definitions and say that Illinois imposes strict liability for dog bites. This decision makes a lot sense on its face. The Court found the dog owner not responsible while the animal was at the vet clinic. The owner had no clue what was going on with her dog, and she had given the dog to someone to care for. However, this is a bad ruling for the victims of dog bites, as it moves Illinois farther away from strict liability and imposes more gray area into when a dog owner is responsible for his/her dog’s actions. Basically, the Court’s opinion opens the door for future situations when the owner left the dog alone, or maybe under the supervision of a child or someone incapable to keep the dog under control. Those owners can now point to this case as a way to escape responsibility to their victims.